Looking for a more eco-friendly way to brush? Ever consider the amount of waste that accumulates from old toothbrushes? It may not seem like much when you only consider yourself, but think about your entire family, neighborhood, town, or state. Everyone knows how important it is to recycle and choose biodegradable products when possible. We all know about recycling paper, plastic, and glass. It gets harder when thinking about recycling things that aren’t 100% recyclable. What people may not know is that there are alternatives to traditional plastic toothbrushes that will reduce the waste that frequent toothbrush changes cause. These five toothbrushes provide a unique way to brush that will lessen the negative impact they leave on this earth and still help against gum disease, which will give environmental enthusiast another reason to smile. This company sends their toothbrushes in a recycled wrapper that doubles as a return mailer for sending the toothbrush back for recycling. 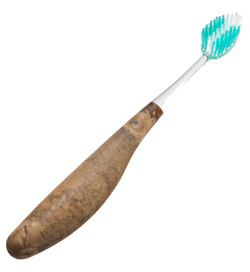 The toothbrush itself is also made of post consumer recycled materials. The handle on this toothbrush is made of bamboo, which is a natural cellulose fiber. The brush also features biodegradable bristles and comes packaged in a cardboard box making almost the entire toothbrush and packaging biodegradable. This toothbrush is made of a bio-plastic handle made with recycled dollar bills, wood, or flax blended with 100% recycled polypropylene. The toothbrush offers replaceable heads which cut back on 93% of waste. The plastic used in this toothbrush breaks down to no more than CO2, water, and humus. The brush is also made with antibacterial bristles and 100% FDA compliant materials. These toothbrushes, made of cellulose acetate, are entirely biodegradable and come in a simple pearl design. The next time you need to change your toothbrush, consider checking out one of these earth-friendly brands. Each brush offers something that will support the environment, and some at a cost that is less than what you may be paying for your toothbrush now. They will provide the same function as an ordinary toothbrush, but the impact after their use will be dramatically lessened. Thanks, I’ll check out your review on radius! I am currently thinking about switching to self hosted WP but I haven’t made the decision just yet. I assume your site is self hosted on WP? It’s really great- so much information! Mine is still a little baby blog. But I am really hoping to turn it into something more substantial. Thanks Allison, Cute site BTW… let me know if and when you’re ready to move to self hosted WP 😉 So, you’re correct the guest poster did not provide locations to shop and since he’s UK based location may not have been too useful to many of my readers. I did a review on radius http://eco-officegals.com/2008/11/24/flaunt-it-monday-radius/ a while back, liked them a lot! You can get a direct link over there. Preserve is fairly popular, I believe I have seen it at some of the more mainstream stores like Target and Publix. The others may also be available at a store like target since they do try to give some eco-friendly options in their selection, but if you have a Whole foods near by you may have better luck. Otherwise, shopping online at their sites directly or at Amazon may be the way to go for the ones not available in your area. Anyone else seen any of the options in your local spots? Hey! Excellent article about toothbrushes. I have been feeling guilty about mine for a while now, but it’s probably best not to replace it until it actually needs replacing. When it does, though, I will certainly look into these options. Is there anyway you can provide links or information about where to purchase them? Thanks so much! !